We would like to inform you that our e-shop now offers an option to choose PayPal as payment method. We believe it makes payments easier and cheaper namely for foreign customers. please be informed that all activities have been taken over by company JaPo Publishing s.r.o. since January 2019. All company information are mentioned in the folder Contacts. Czech text of title „Messerschmitt Bf 109s of KG(J) 6“ is finally available. You can download it from title’s page. We are sorry for the delay. You can try our retail shop we have just launched. It is intended for individual orders of smaller amounts of titles. Browsing product's pages you can also add the titles into your shopping basket using basket icon. We added a correction for Messerschmitt Me 262 production & Arado Ar 234’s final operations publication. You can find it in title details clicking on icon below book cover picture. JaPo realize a lecture “Chrudim airbase in the Luftwaffe service” which takes place at Regional museum at Chrudim on 28th April 2015. The theme covers Luftwaffe training and combat activities at Chrudim airbase during the WWII. On the occasion of the issue of the “B-24 Liberator in RAF Coastal Command Service with Focus on Aircraft of No. 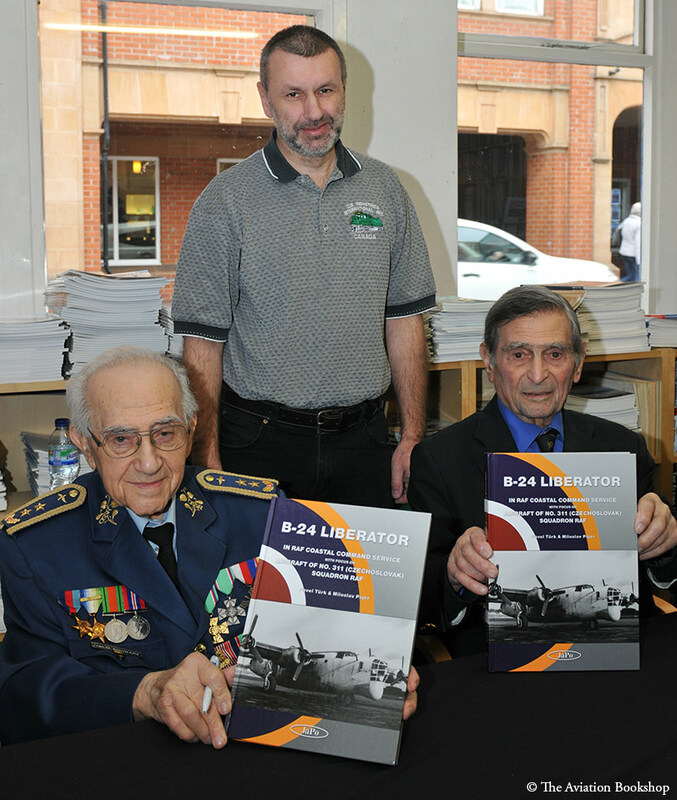 311 (Czechoslovak) Squadron RAF” the book launch & signing event with veterans of the 311th (Czechoslovak) Squadron RAF was held in premises of The Aviation Bookshop in Turnbridge Wells on 14th March 2015. 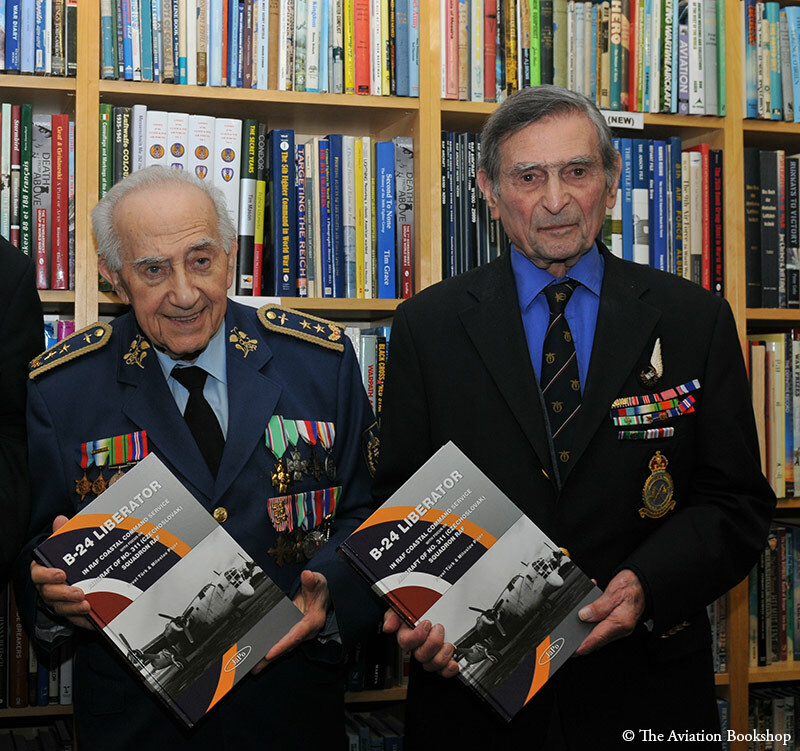 The photos attached capture Mr. Ivan Schwarz and Mr. Arnost Polak together with the book author Mr. Pavel Türk. We have a pleasure to announce the issue of the “B-24 Liberator in RAF Coastal Command Service with Focus on Aircraft of No. 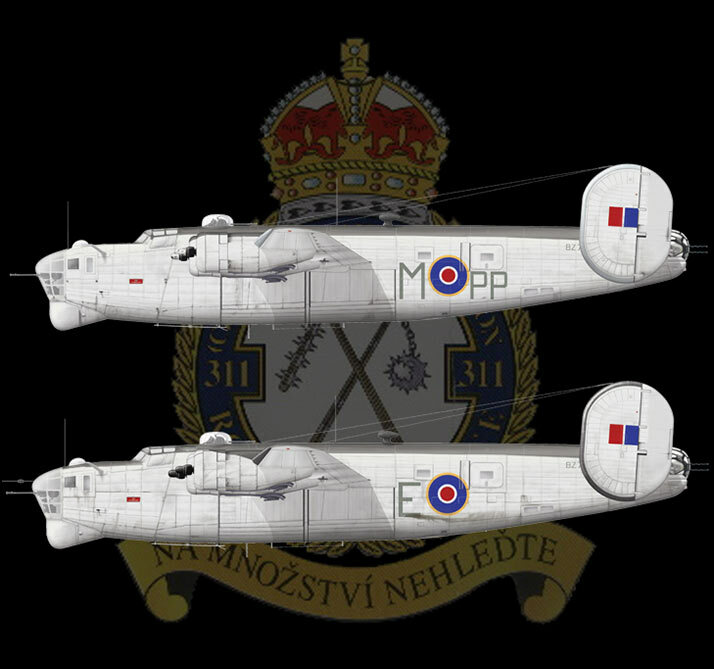 311 (Czechoslovak) Squadron RAF”. The title is available now and you can purchase it through our usual distributors. Consolidated B-24 Liberator is one of airplanes which deserves special attention of aviation historians. B-24s took part in combat actions in all theatres of operations of WWII under quite different service conditions and performed everytime their tasks honourably. They flew over occupied Europe, heavy defended Germany and Japan, over Mediterranean, jungles of Burma and India, over wide areas of Atlantic, Pacific and Indian Oceans and among peaks of Himalaya. With the number of aircraft produced - most numerous of all American and British airplanes and with the prolific combat career during WWII the B-24 belongs to the legends of the conflict and is predestined for being a thema of various titles. Number of airplanes produced, different producers (Consolidated San Diego, Consolidated Fort Worth, Ford Willow Run, North American Dallas and Douglas Tulsa) and various operational conditions anticipated development of versions and variants which is the thema the author Pavel Türk has focused on. His extensive study provides systematic analysis of airframe differencies, armament and equipment of all variants according to producers, production batches and different users - USAAF, US Navy and Royal Air Force. The respectable range of the work however requires split into several parts which will be linked each other. on 300 pages with 550 photos, color profiles of 52 aircraft, hardback cover. Publishing is expected in 2014. 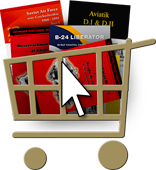 Due to extensive range of the title we recommend not to spend all money on Christmas 2013.
and will cover analysis of airframe differencies, armament and equipment of all variants used by USAAF, US Navy and Royal Air Force. We are convinced that the complete work would be „must to have“ for all fans of the B-24, for all who are interested in service of Czechoslovak pilots during WWII and certainly for modellers. 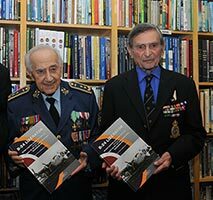 We would like to inform you that the „Messerschmitt Me 262 production & Arado Ar 234’s final operations“ left the printing shop and is presently distributed to our partners. the fighter protection of Me 262’s air bases in the form of ammendment to the „Messerschmitt Me 262s of KG & KG(J) units“ is prepared with comparison of planned and actual Luftwaffe’s effort in this field. The detailed analysis of a Bf 109K-4 of III./JG 27 taking part in the protection is included. The text is accompanied by nearly 220 photos, number of data tables and original documents as it is usual in our publications. The new title „Messerschmitt Me 262 production & Arado Ar 234’s final operations“ from our „Luftwaffe over Czech Territory 1945“ line is in final stage of preparation. 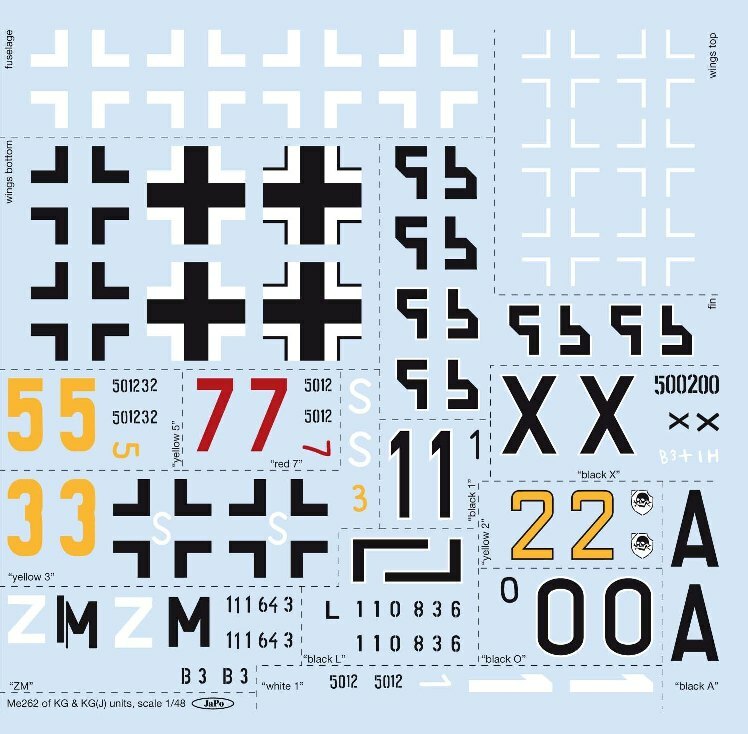 Limited number of decal sheets covering markings of all a/c described in the „Messerschmitt Me 262s of KG and KG(J)“ title were issued in 1/72 and 1/48 scale – see below. 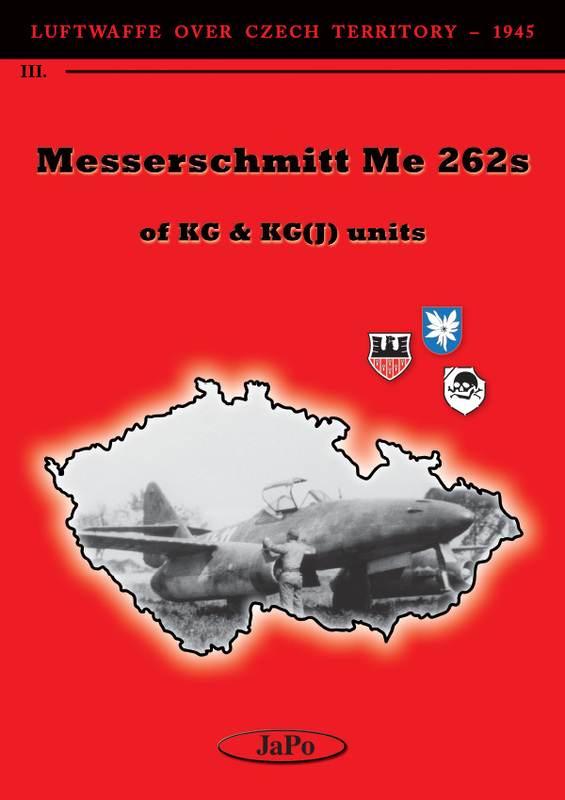 We would like to inform you that the Messerschmitt Me 262s of KG and KG(J) units left the printing shop and is presently distributed to our partners. 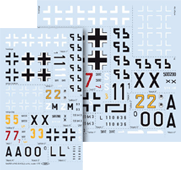 Contemporary we would like to let you know that the (very) limited edition of 1/72 and 1/48 decal sheets is planned for the beginning of 2011. Sheets will be added to the marked books and distributed together. Another project relating to Me 262s connected with Czech area is under preparation. In contrary to the current title describing a/c of units operating from Czech air bases we will focuse on Me 262s produced or assembled at plants located in Czech area, i.e. Me 262s from FWE at Cheb (Eger) and from LBB at České Budějovice (Budweis). It is hard to believe that we are in final phase of preparation of another title. Our forthcoming publication will extent our line of „Luftwaffe over Czech Territory 1945“ with the title Messerschmitt Me 262s of KG(J) and KG units. It is for the first time we are dealing with the Me 262 in more details, other standard features of our titles remain, i.e. the title will be issued later and the publication will be larger than originally planned and expected. Brief history of Luftwaffe’s effort to increase number of jet fighters by retraining bomber pilots for fighter tasks. 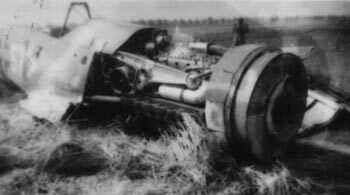 Therefore IX.Fliegerkorps(J) was based under Dietrich Peltz command and several KG units were transformed into KG(J), but only KG(J) 54 reached regular operational status and was sent into action. It was transferred to Prague in April 1945 and together with JG 7 and fragments of KG(J) 6 saw final battles over Bohemia, Germany and at Prague. The KG 51’s operations with Me 262 were quite different story. This regular bomber unit flew operationally from the late of 1944. At the end of April 1945 several aircraft moved to Prague, joined other Me 262 units there and took part in final actions. Description of 11 aircraft of KG(J) 6, KG(J) 54 and KG 51 which were flying over Czech area in final days of WWII including of two Me 262Bs. It is quite unusual in historical research of WWII aircraft to have an opportunity to touch real peace of history described. It is the case of Me 262A, „Black X“ of KG 51 which was fighting from Prague in May 1945, then left to Fassberg to surrender and to be finally preserved at Australian War Memorial at Canberra. It allowed us to provide extensive documentation of research realized in the 80’s as well as up to date conditions. 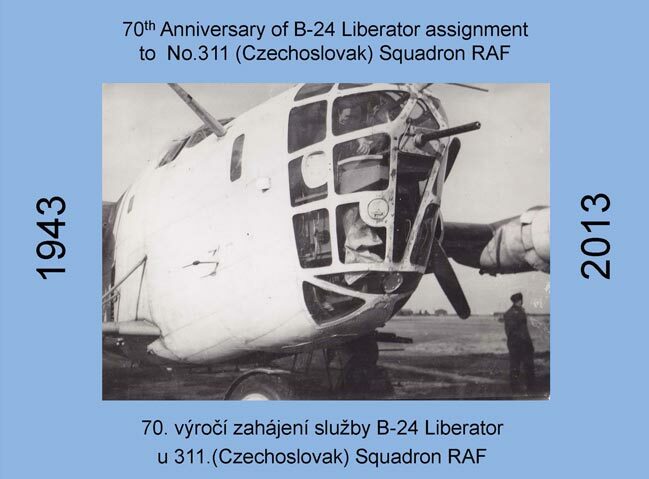 Although not directly connected with actions over Czech territory the description of Me 262B productions is included. Text is accompanied by nearly 300 photographs, tens of original documents and tables. 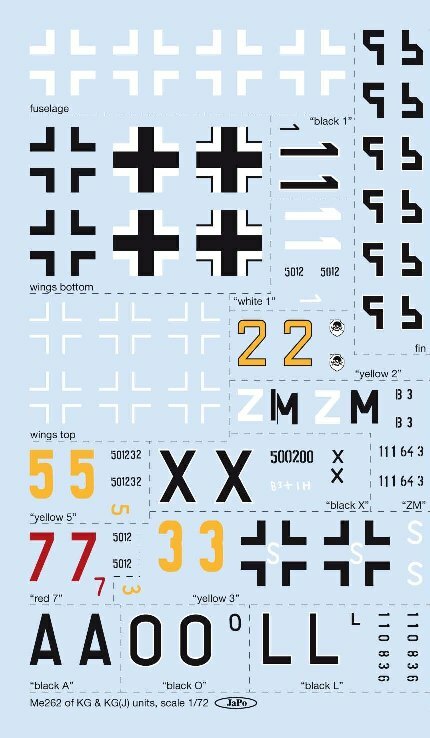 We would like to inform our readers that the third volume of Focke-Wulf Fw 190D - camouflage and markings is currently being worked on, and the following lines aim at revealing some of its content. Part III will focus in detail on a number of topics that are seemingly only loosely related to the main theme. However, we believe they are equally important, as aircraft were completed with camouflage and markings during the manufacturing process, and the relevant procedures were an integral part of series production. Consequently, the knowledge of the organisation of the Fw 190D production is essential to understanding the aircraft's widely differing camouflage styles and irregularities that could easily be listed as “nonsensical”. Based upon such knowledge we will attempt the reconstruction of camouflage patterns applied by individual manufacturers, highlighting the principal differences – this will be the key section of the coming monograph. Furthermore, technical differences between various batches of Fw 190Ds as a result of the widely dispersed production process will be described to the extent possible. The system of the three-letter identification codes of Fw 190D and Jumo 213 manufacturers will be explained. The results of our latest research will be included in addition to these principal topics, and as a result the information included in earlier books will be corrected and further specified. Fw 190D-9, W.Nr. 400271 of III./JG 2 proves the importance of acquiring the “right” picture. Until recently, this particular aircraft was generally identified as “Black 1” as supported by available photographs. 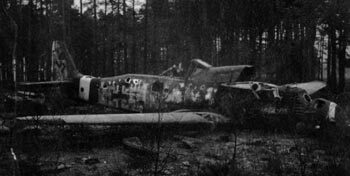 However, a newly discovered picture of this Fw 190D-9 proves this long-standing assumption wrong and amply demonstrates how a particular unit’s specific practice (and / or ignorance thereof) can affect the interpretation of a photograph. III./JG 2 definitely applied an unusual style of the digit “4”, and the fact that the style was typical of the unit is further confirmed by the same style of numeral on Fw 190D-9s, W.Nr. 600434, “Yellow 4” and W.Nr. 600xxx, “Black 14”, both of III./JG 2. The white number “59” on the tail fin of Fw 190 V65, W.Nr. 350165, “CS + IA” is another example of confirming one of our earlier hypotheses, and the photograph of the aircraft’s port side provides definite evidence. 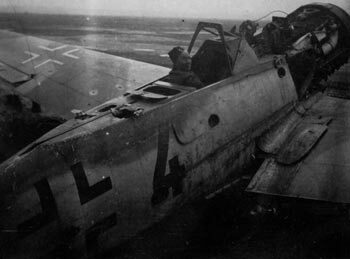 Previously unpublished photographs of other Fw 190Ds will provide new information. 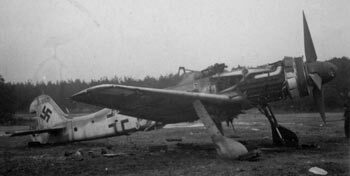 For instance, a series of pictures from Hustedt airfield shows several abandoned Fw 190Ds of JG 26, all of which appeared on a British list of captured aircraft. It will be most interesting to compare the list with reality. Moreover, one of these photographs confirms our earlier reconstruction of the tactical marking of W.Nr. 500647, i.e. “Brown 4”. We based our drawing on the style of the digit “4” as it appeared on other aircraft, and this new picture has confirmed our proposition. We were fortunate enough to having discovered new documents on the production and assignment of Fw 190D-13s. In addition to written documents, photographs have become available as well and as a result of this the aircraft’s accurate reconstruction became possible, allowing for the introduction and full description of every known aircraft. Further information on variations in camouflaging and markings of this model may be added as our research progresses. Thanks to the good offices of some of our friends around the world new documents on the Fw 190D-11 were made available to us, and the limited production of this model, including its technical description, can now be addressed in greater detail than ever before. Other particular aircraft will be presented in chronological order (i.e. according to their respective manufacturers), and their descriptions will be provided in the now-familiar JaPo style developed in our previous books. In conclusion, our work on the Fw 190D saga is on-going, but stating an exact date of its completion would be a clear sign of ignorance vis-a-vis our readers. In other words, the present announcement is nothing but an assurance that the topic is still alive. Having said that, we strongly believe that in our future Part III we will cast light on some unsolved questions related to the camouflage and markings of the Fw 190D and be able to show several interesting “Doras” in colour. We are finishing the next volume of our specialized line “Luftwaffe over Czech Territory – 1945” now. The title “Messerschmitt Me 262s of KG & KG(J) units” will be dedicated to Me 262s of KG(J) 6, KG(J) 54 and KG 51 operating from Prague area airfields in the last days of WWII. The title would be issued in the first half of 2009. 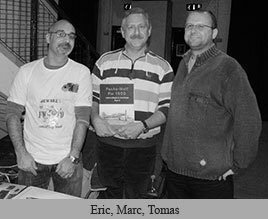 It is with great sadness that we must announce that our friend and co-author Eric Larger has passed away very unexpectedly during the night of Thursday 10 October. Only hours before we had been co-ordinating our next meeting to discuss the work on, and compare material and notes for Part III of “Focke-Wulf Fw 190D – Camouflage & Markings”. We shared many other interests and had established concrete plans on preparing other publications – all this has now come to an abrupt halt. We have lost a good friend, and the aviation research and modelling community a talented contributor, but above all it is a devastating loss for his wife Pascale and their three children, to whom he was a wonderful husband and a great father – may they all be in your prayers and thoughts. We would like to inform you about finishing of the “Focke-Wulf Fw 190D camouflage & markings Part I” reprint. The title is in stock again and you can order it through our usual distributors. We have a pleasure to announce the new title “Soviet Air Force over Czechoslovakia 1968-1991” is in the print and would be available in June. Although we could say the issue was planned exactly to 40th anniversary of invasion of Warszaw Pact allies into Czechoslovakia we honestly declare the title is as usually in delay. The Part I is dedicated especially to invasion (Operation “Danube”) in 1968 and creation of Air Force of Central Group of Forces (CGV) in CSSR. The Part II will be focused at air-bases of Soviet Air Force at Czechoslovakia – Milovice-Mladá, Mimoň-Hradčany, Olomouc-Neředín and Zvolen-Sliač. Contemporary we would like to ask for support especially in the form of photos of Soviet aircraft taken in Czechoslovakia. Your help enables to extend this line by additional parts. We started another extensive project “Luftwaffe Pilot Training in Czech Territory”. For more information see “Other Projects” folder. on Saturday between 11.30–1.30pm and 3.30pm–4.30pm and on Sunday between 12.30–2.30pm. We have a pleasure to announce the issue of the “Focke-Wulf Fw 190D Camouflage & Markings, Part II”. The title is available now and you can purchase it through our usual distributors. We hope you will enjoy the Part II as well as the Part I. Readers are invited to visit the JaPo discussion pages and study the revised article on “Red 13” of JV 44, as amended and completed with recently discovered material regarding W.Nr. 211040, which was originally thought to be the possible Werknummer of “Red 13”. “Focke-Wulf Fw 190D – Camouflage and Markings, Part II” – JaPo is proud to announce that this ambitious project reached another milestone, as the final version of the manuscript of Part II was delivered to the printer. Visitors of our site are invited to refer to the product details where we present a number of sample pages. Corrective file for “Messerschmitt Bf 109s of JG 52 in Deutsch Brod” with additional information was placed at the web site. The icon for download is located below the title cover in “World War II Czech Territory” section. New web site at new address www.japo.eu was launched.